The American Chopper scene, clipped from an old reality TV show, is a hilarious meme for any two-sided argument. 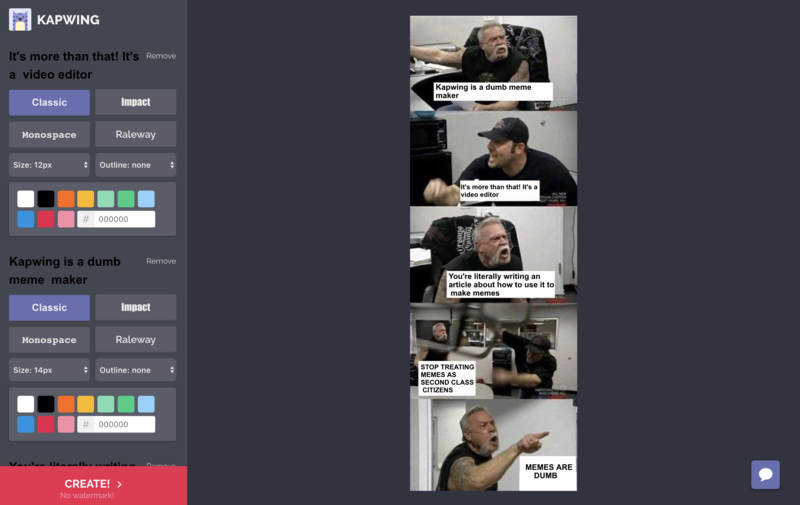 In this post, I’ll describe how you can make your own American Chopper memes for the passionate debates in your life. Step 1: Upload the video The original clip is 2 ½ minutes long, but thankfully the internet has already cut out the best ten seconds. 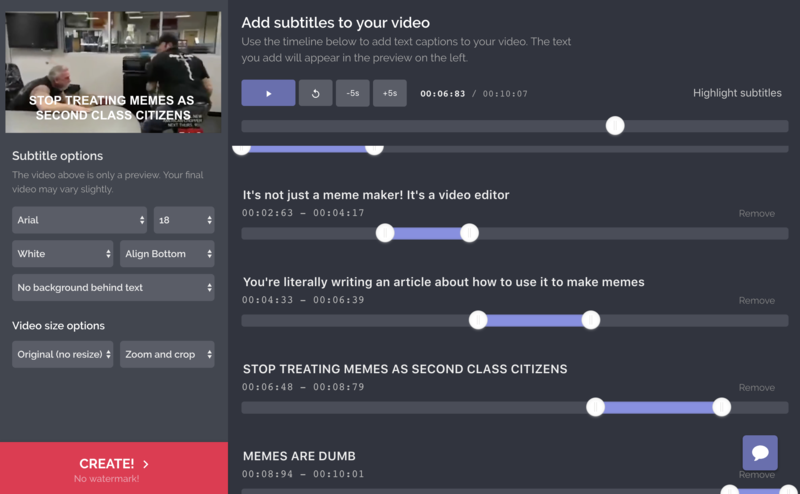 Copy the YouTube URL and navigate to Kapwing’s free online subtitle video tool. Then, paste the YouTube link directly into Kapwing’s Subtitle Maker and wait for it to upload. (Kapwing is free to use and online, so it works on any device). Step 2: Add original captions In the Subtitle editor, add captions to represent the scene’s dialog. Time the subtitles so that they match when each dude is speaking. You can preview the subtitled video on the left panel and resize for various social media platforms. Step 3: Create and share Once the video preview matches what you want, click Create and wait while your video is processed. Then download your American Chopper video meme and share the mp4 on social media and/or with your friends! Bonus: You can also use Kapwing to silence the video’s original audio. Step 1: Copy the template You can use this template to make your American Chopper memes: https://i.imgur.com/8SAyRGD.jpg. Or, you can use a Collage Maker to design your own. Step 2: Add meme text Come up with original captions to represent the argument and add the text to your meme. You can use this ‘Add Text’ tool to embed your text directly onto the image (it also supports GIFs and video). Just paste the template URL – https://i.imgur.com/8SAyRGD.jpg – to Kapwing and position your captions in the speech boxes. Step 3: Download and Share Once the meme preview looks good, click Create and wait while your image is processed. Then download and share with your friends or on social media! That’s how you make the American Chopper memes that are trending on social media! This meme is a great medium for simplifying complex arguments and making people laugh. Happy meming, and show us the results by tagging #kapwing on Twitter, Instagram, etc.